My camera phone stinks, but here it is! You guys are going to love the illustrations. Bryan Beus, you are The Man. 1. I should be getting my manuscript for THE MAZE RUNNER from Krista in the mail today. It's now gone through "copyediting", which means it's been proofread and all that and I need to read it and accept or reject changes by the copyeditors. Krista said it's very clean so it shouldn't take long. Then I think it goes to typesetting and ARCs can't be too long after that! 3. 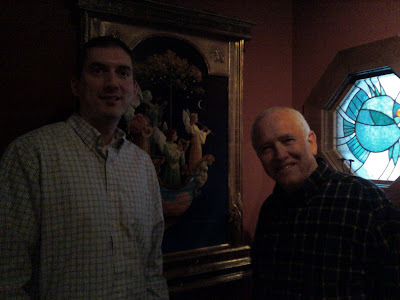 My wife and I had the awesome opportunity to be in the home of James Christensen last Saturday. He is our favorite artist, and it was like visiting Santa Claus. His house is so cool, and he has originals of his famous works hanging up everywhere. I really wanted to swipe one, and even offered him 5 bucks, but it just didn't work out. He's a very selfish man. 4. Writing update for 13TH REALITY BOOK 3: 32,068 words. I'm really enjoying this thing. 5. Michael (my agent) asked me to write a synopsis for the 2 sequels to MAZE. Here's some background. We sold MAZE as a proposal, based on 50 pages and a synopsis. I think because of that, we only sold a one book deal. I've always planned this to be a trilogy, and we're not sure when RH will be interested in pursuing the next book deal, hopefully for both sequels. But Michael wants to be ready with a synopsis if they ask. And based on the in-house buzz we're hearing about, I really hope that's sooner than later. 7. I'll get you much more details on this later, but if you live in the state of Utah, I have excellent news. Krista Marino is coming to the big week-long BYU conference for writers and illustrators this summer, June 8-12. I can't wait to meet her in person and get to know her. I'll also be teaching a workshop at the conference. I can say this from experience: if you can possibly make it, don't miss a chance to schmooze Krista with your work! Trust me on this. Sell one of your kids if you have to. Rob old ladies. Sell your heart on the black market. Don't miss this opportunity. More details to come. Well, that's about it for now. Later. I'd love to hear any of your thoughts on this. Let the arguing begin! 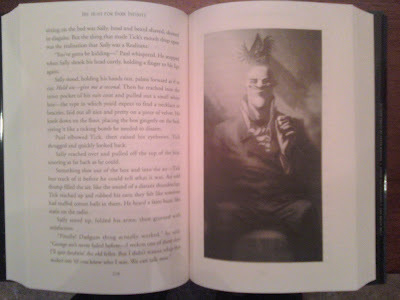 Personally, I'm extremely pumped about Neil Gaiman winning the Newbery for THE GRAVEYARD BOOK. He went out of his way to spend 15 minutes talking to Brandon Mull and me at BEA, and I've never forgotten it. He is such an awesome dude. And his book rocks. And I just don't see how HUNGER GAMES doesn't get on the Printz list. Well reviewed, and every person on Planet Earth loves it. Oh, well. I wanted to wait until tomorrow, but you know how I am with good news. Can't ever show any patience. Well, it is MY blog, ya know? Plus, the whole point of this blog was for my readers to experience the day to day life of an author. I received a very happy phone call today from Lauren Abramo from my agency, Dystel & Goderich. She's over subsidiary rights, and today we sold the audio rights for THE MAZE RUNNER to Listening Library, a division of Random House. It will be published for both the retail and the library market at the same time the book comes out (Christmas 2009), unabridged, on both CD and digital download. To learn more about Listening Library, CLICK HERE. 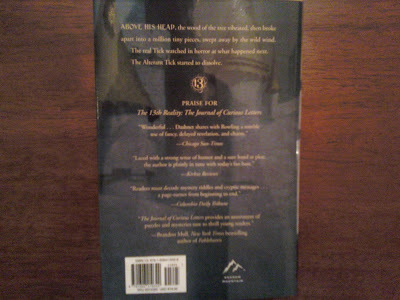 They are awesome, best of the best, and they do audio for much more than Random House. For example, they also do Percy Jackson, the Twilight books, and Harry Potter to name a few. I'm very excited, not only to be with them, and to stay with a division of Random House, the same company doing the book itself, but I'm also just ecstatic that MAZE will be on audio period. I had no clue until today. Kudos go not only to Lauren for getting this deal, but also to Michael Bourret for originally keeping all the subrights to MAZE in the first place (audio, foreign, UK, movie, etc.). Otherwise it would've been a long time before I saw any money from this. So there's a little lesson on the business side of authoring. I can't wait to hear it on audio. I think it could really work well, unless they hire that deep-voiced dude from American Idol's first week of auditions. Okay, onto the second item. We got our first major review for THE HUNT FOR DARK INFINITY today, and it's from Kirkus. At first I didn't think it was really that glowing OR negative, just kind of neutral. But on further readings, I think it's very good. The only thing even slightly negative is really just a plot misunderstanding (when they say "no explanation"). In hindsight, I could've made that a little more clear. Now, it's semi spoilerish. You know me. I'd hate to read a review like this before reading a book. I'll put up a warning both before and after the review. Read at your own risk. Tick, Paul and Sophia were brought together to solve a set of clues that led them into other dimensions in The Journal of Curious Letters (2008), the first installment in this intriguing series. They’ve spent the summer relaxing with building anticipation for their next call to action. It isn’t long in coming. A message from Master George tells them to meet in the woods for transportation to headquarters and their next assignment. They’re whisked away into another reality…but was it Master George who did the whisking? "intriguing series" Yes, indeed, my good man. "an imagination that crosses Salvador Dali with Baum's Land of Oz" Boo-yah! "holds together remarkably well" Why, thank you. "glorious flights of imagination" Ah, glorious. Simply glorious. Not bad, huh? Kirkus has been known to be tough, so I'm more than thrilled with this review. Finally, a very interesting article in Time Magazine about the future of the book industry. You can read it by CLICKING HERE. Cauliflowerwriter asked how I managed to work on two projects at once - back when I was doing rewrites for MAZE and finishing up 13th Book 2. Well, truth is, I wasn't. I have a hard time with that, and only do it when I must. Book 2 was pretty much done by the time I received my rewrite stuff from Krista at Delacorte. And I actually postponed working on Book 3 until the maze work was mostly done. When I DO have to work on two things at once, I try to split it between morning and afternoon. My mind at least has that lunch break to switch from one thing to the other. Thanks for the question. If anyone ever has one, just leave it in the comments and I will get to it quickly. I hope everyone enjoyed the inauguration yesterday (though CNN needs to pull back on the cheese a bit - my favorite was when they gushed and gawed for 5 minutes about how excellent Obama's penmanship is). I really enjoyed seeing the history of it all. No matter your politics, it's pretty amazing that we now have a President who would've been a slave in the same country a couple hundred years ago and would've been turned away from many establishments just forty or so years ago. I'm rooting for this guy. Happy Martin Luther King Jr. Day! CNN showed the full "I Have a Dream" speech today and I recorded it for my kids to watch tonight. Hopefully they'll have a Cosby Show moment. Remember that episode? Um, remember that show? Writing is going well. My latest update: Book 3 is now 20,011 words. 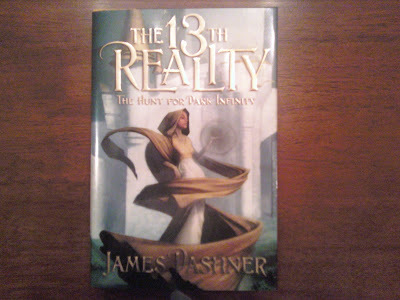 I noticed my publisher did some updates to the 13th Reality website. I think they're still working on it, but if you haven't been there in awhile, go check it out: http://www.the13threality.com/. 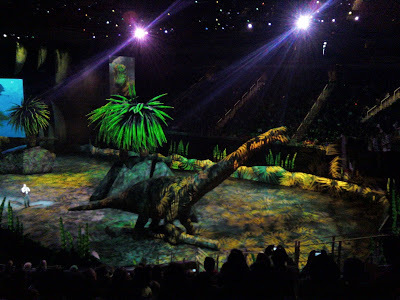 This past weekend my family went to see the Walking with Dinosaurs show that's currently touring the nation. 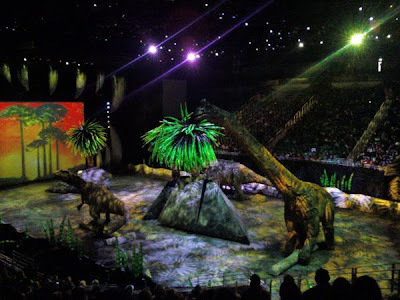 It was expensive, which is really sad because the place was only half full and the show was awesome. 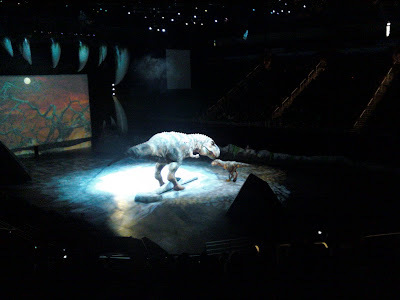 We, of course, bought the cheapest tickets (still 30 bucks each, even for kids!) and then went down to sit in this huge empty section near the front. Think smarter, not harder. Remember how we used to do Q&A? Okay, "used to do" makes it sound like we did a lot of it. In fact, I think I officially posted Q&A seven or eight times (see links on sidebar). We need to get that going again. So, if you have a question you'd like me to blog about, please leave it in the comments. 1. Peggy asked if I would share the link to the article by Publisher's Weekly about how children's sales did well over Christmas. Well, of course. I should've done that in the first place, duh. CLICK HERE to read it. 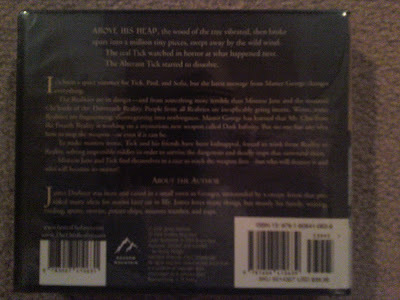 Notice it mentions FABLEHAVEN by Brandon Mull! 2. Brian asked if there is a working title for Book 3 of THE 13TH REALITY, which I'm diligently working on the next couple of months. Well, not only is there a working title, there's an official title. At least, I think it's official and will be revealed at the end of Book 2 coming out in March. Originally I'd called it The Blade of Blood and Sorrow, but for some inexplicable reason my publisher thought that was too morbid. Can you believe that? The nerve. And don't worry, the title doesn't refer to some hokey magical sword. It's more of a metaphor. For something really, really, really bad. 3. Jeremiah asked how to find my facebook account. Well, luckily I have an unusual name, so it's really easy. My account is under James Dashner. Just search for that and you'll find it. 1. A clarification: Some of you pointed out the sillywilliness of my doing movie reviews when I specifically said that I don't read movie reviews. Excellent point! The reason I don't is because they always tell you at least half the plot, often more. It's worse than watching a preview. Notice in my reviews I didn't tell you anything about the plot. Now, this may make my reviews about a nine on the suckage scale, but there you have it. Now that I think about it, simply telling you whether or not I liked a movie might not be of much help. Unless, of course, you find out your tastes are similar to mine, then my reviews will be perfect! Glad we got that all figured out. 2. Fellow author Ally Condie asked how many words my last revision of THE MAZE RUNNER ended up being. It was 104,000 words. That's my longest book yet, and I'd guess it'll end up being about 400 to 450 pages when published. Hi Ally! 4. Speaking of release tours, I think it's going to be much shorter and simpler this time around, just 2 or 3 weeks. Why? I have no idea. But I suspect it's because of the economy's affect on my small publisher. Please don't let me use the words "I suspect" again. Sounds really stupid. 5. Speaking of the economy, PW had an article about how well the children's/YA book industry did over Christmas. That is excellent news for people who write those types of books. Like, me. 6. Rememeber you can be a "Follower" of this blog. Look for the link on the right side of the blog. Remember also that I am now on Facebook, and my blog posts go there automatically every time I do it. Friend me! 7. As we get closer to the release of Book 2, I'd like to have more reviews on Amazon because a lot of people will be scrutinizing Book 1 as I'm still a relatively unknown author. So, if you've read it, and especially if you liked it, please head over to Amazon and do a quick review! CLICK HERE. 8. My kid is the 13,543,762nd person to discover DIARY OF A WIMPY KID. He read both of them in a day or two and is anxiously awaiting the release of Book 3. 9. I finally read ODD THOMAS by Dean Koontz. My review: good. 10. Update on my first draft of Book 3 of 13TH REALITY: 8,042 words. Somehow I always end up with ten things when I do this. I think I'm OCD on that. Hope everyone has a wonderful, wonderful week. One of the many quirky things about me is that I refuse to watch movie previews. Most of them today completely ruin the movie - either telling you the entire plot or making it obvious what the big twist is going to be. They are infuriating! Therefore, when I'm with my wife or someone else at the movies, I make them talk to me (very quietly) during the previews. If I go alone, which I sometimes do to take a break from writing, I listen to my iPod very loudly with eyes closed until the previews are over. Commercials on TV? I either mute it or fast forward. I don't read reviews, which are usually worse than the previews in giving things away! Anyway, if you think I'm psycho, I issue you a challenge. Try it. Movies are SO MUCH BETTER when you don't know ANYTHING about them beforehand. Trust me on this. Now, does this mean you'll see some lemons? Yes. But you can usually at least tell from the poster/ actors/ director/ writer whether or not it'll be halfway decent. And you'll have some movie experiences that you'll never forget. Try it. Sometimes its impossible. But I've gotten very good at it. Movies are my second love behind books, and avoiding previews has made it all the richer. I'm not pyscho! Try it! I'd wanted this movie to be good since the first time I heard about it. I love WWII history, I love Tom Cruise (despite his interesting off-field shananigans), and I loved the other cast members. I was a little worried about the X-Men and Superman Returns (blah) director being in charge of a history movie, but I still couldn't wait. But he also did one of the greatest movies EVER: The Usual Suspects. Then I spent the last year ignoring all the bad press about it, and then the massive marketing campaign, and then the early reports that Tom Cruise had performed one of the worst acting jobs in history. Bullocks. So he didn't use a German accent. THAT would've made it stupid. I thought he was great, the Tom Cruise I know and love. This movie, despite knowing the ending because obviously Adolf Hitler was not assassinated, gripped me from beginning to end. You can feel the unbelievable stress of taking on such a monumentally risky operation, and there's never a dull moment. Plus, it was so moving to see the bravery of these men, to see that there were people in that regime willing to do whatever possible to topple the evil that had taken over their homeland, knowing the slightest mistake meant certain death for them. I loved it. I really, really loved it. I did really like this movie. Despite being almost 3 hours long, I can only remember maybe a 10 minute stretch where I "kinda" got bored. And there were so many good things about it. Brad Pitt and Cate Blanchett were great, but they were almost overshadowed by the supporting actors. The music was great. The directing, the cinematography. The writing was excellent. The makeup and digital enhancements for the aging and "younging" process are so amazing you won't believe it. And the narrator constantly throws out these little tidbits of wisdom that have still stayed with me. An example, and I'm paraphrasing: Our lives are defined by our opportunities, often by those we fail to pursue. As long as you go into it knowing it's long, I think you'll really like it. Well, there you have it. My first movie reviews in many months. I need to do that more. I'm not really a movie critic - I try to go in with an open mind and enjoy it if it's at all possible. I love movies. I love movies!!!!!!! Have a great weekend. Go catch a flick. The Maze Runner is a go! Sorry, we'll have to save the movie reviews for Friday. It's time to celebrate. 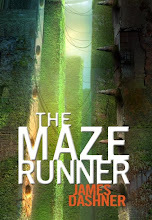 I just received word from Krista that she has officially accepted this version of THE MAZE RUNNER and has sent it on to copyediting. She loved my changes in Round 2 of our revisions and I'm officially giddy. After three years of hard work on that book, I'm done! I'm actually and truly done! It feels more real than ever now. I can quit worrying about it and just be excited to see it on shelves. We still don't know the definite release date, but sometime this fall, probably close to Christmas. Michael (my agent) immediately sent me an email and said we can also start submitting it to foreign and film rights agents. Since we sold it on proposal, he wanted to wait until we had an officially accepted final version. And now we have one! Michael is really making sure I don't get my hopes up too much, however. With the economy in the toilet, he has a gut feeling that most people will want to wait and see how it does when released. So at this point, I'll see any additional sale as icing on the cake. Anyway, I'm very happy this morning. Very, very happy. Movie reviews on Friday. I'll give you a hint as to which movie I liked best: I'm currently reading an awesome book about how the Nazis rose to power in post-WWI Germany. I've been spending the last couple of days trying to come up with something really cool to blog about to kick off the new year. Couldn't think of anything. What am I, an author? I hope you all had good times over the holidays, and today it's back to the grind for most of us. Actually, I had to work quite a bit over the break to finish Round #2 of my revisions with Krista for THE MAZE RUNNER. I turned it in Saturday. Boo yah! I really think we'll be close after this round - I feel really good about it. And it was much more painless than Round #1. Oh yeah. 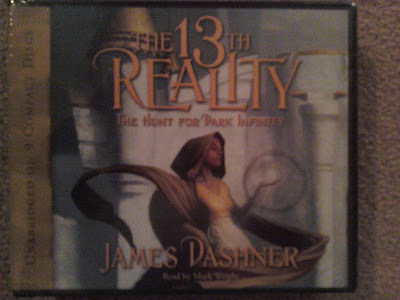 Now I have to get down and dirty on Book 3 of THE 13TH REALITY. That will be my only focus these next 2 months, and I wouldn't be surprised if I have a first draft done by the end of February. End of March at the latest. It's gonna be fun! Does anyone know how to do one of those progress lines for word count? That'd be fun to add to the blog sidebar. 2008 was a great year. Who knows what 2009 will bring? Carol Lynch Williams, an awesome author and friend (who just got endorsements from Gregory Macguire and Meg Cabot for her new book), made us set goals last year. Mine were to sell MAZE, sell paperback rights to 13TH REALITY to a NY pub, and to write Books 2 and 3 of 13TH. Other than finish Book 3, I (we) accomplished all of those - and the reason Book 3 didn't happen is because of MAZE, so I don't feel bad at all. 1. Write Book 3 of THE 13TH REALITY. 2. Write another book for Random House (hopefully the sequel to THE MAZE RUNNER). 3. Sell at least a 2-book deal to RH. 4. Sell foreign rights (how many? no clue) and film rights to MAZE. 5. Sell film rights to 13TH. Some other things I'd like to accomplish: learn how to write a screenplay, write a proposal for an early chapter book series, and get invited to some of the bigger national writing conferences. I kind of just did those on the fly, so we'll see how it goes. Switching gears, I've had the hardest time getting over the Falcons close loss to the Cardinals in the first round of the NFL playoffs. It's killing me! I just think they were the better team and could've beaten Carolina in the next round (Falcons won last time they played). And I think Philly will beat NY, which means the Falcons would've had a home game for the NFC Championship. Oh, the misery. The horror. Woe is me. Actually, I should be very happy. The Falcons were 4-12 last year, and far surpassed anyone's expectations. Matt Ryan received the Rookie of the Year award, and we had an RB and a WR on the Pro Bowl team. The future looks bright. Georgia trounced Michigan State in their bowl game, and the Hawks are 22-11. All is well, I guess. Those stupid Cardinals!!!!!!! Oops, there I go again. Switching gears again, I saw 3 movies over the break, and I want to review them. I'll do that on Wednesday. The movies are YES MAN, BENJAMIN BUTTON, AND VALKYRIE. Here's a sneak peek: liked one, really liked another one, LOVED another one. Stay tuned.